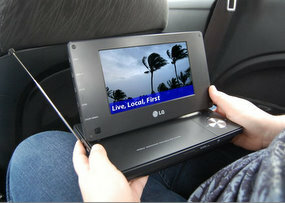 Dimensions: When folded, 9.5" x 6.5"
*Mobile Digital TV (MDTV) Reception – Unlike current portable digital TVs that can only pick up the free over-the-air digital broadcasts in a stationary position, the new Mobile Digital TVs can pick up the new mobile digital signals that allow you to watch TV while moving. You will be able to receive the new TV signals in a car, bus or even on a train! The best part? The new over-the-air mobile digital broadcasts are FREE. Why pay monthly subscription fees for services like Flo TV or MobiTV when you can get Mobile DTV for free! Buy a mobile device that can receive the new signals and you are good to GO! Mobile devices that are capable of receiving MDTV signals will display the MDTV logo and are capable of receiving TV signals while traveling at speeds over 100 miles per hour. On January 6, 2010, LG Electronics introduced the LG DP570MH, the industry’s first portable, battery-operated Mobile Digital TV in the United States. It is designed to receive the new over-the-air signals TV signals being transmitted by local broadcasters. The DP570MH is a truly mobile portable TV. Ideal for reception of Mobile DTV anytime, virtually anywhere, and at any speed, the DP570MH Mobile Digital Television offers the flexibility of both over-the-air reception and the convenience of built-in DVD player. Equipped with stereo speakers and a 7-inch wide screen to display crystal clear digital TV images, the LG Mobile Digital TV is designed so that its display screen can be tilted to the viewer’s preferred viewing angle. The DP570MH comes equipped to play DVDs and audio CDs; it can also display .JPG photos and play WMA music files from its USB 2.0 connection. The Mobile Digital Television comes equipped with two earphone jacks so that more than one passenger can enjoy Mobile DTV shows or movies in the back seat of the car, or on a train. Equipped with a removable battery that powers the device for up to 2.5 hours in TV mode or up to 4.5 hours during DVD playback, the device includes both AC and Auto power adaptors.